Home / Getting Started / What is Conversational Issue Filing, and how do I set it up? Please note: you can only enable Conversational Issue Filing for in-app users once you’ve upgraded to SDK v7.0.1 and above. To upgrade to the latest version of the SDK, see our developer documentation for iOS and Android. Conversational Issue Filing allows you to offer a fully conversational support experience for your mobile users. This can be configured to match our Web Chat experience, and provides a seamless, consistent conversational flow for users across different platforms. You can tailor this conversational flow to feel like a live chat experience, or set expectations for users about when they should expect to hear back from your support team. You can use Automations to send an immediate, custom reply based on the user’s first message, then route and assign this Issue to the right Agent, Queue or Group. When an end user reaches out to your support from within your app, they will be immediately taken to a chat screen. You can configure bots to greet them, collect information about their inquiry, and suggest relevant FAQs, all within a conversation flow that feels like talking to a live person. 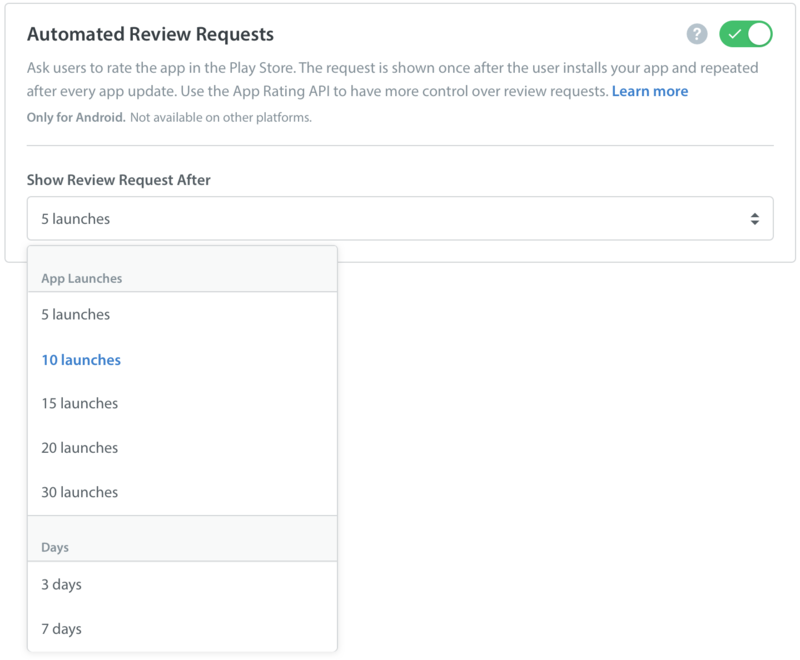 For more detailed steps on how to effectively test your implementation before going live, see What functionality should I test in my in-app experience before releasing it to my users? How do I enable Conversational Issue Filing for my app? To set up Conversational Issue Filing, navigate to the Settings page. On this page, scroll down to App Settings, then select the app you’d like to configure Conversational Issue Filing for. On the page that appears, scroll down to the ‘In-App SDK Configurations’ area, then click the ‘Configure SDK’ button. Navigate to the ‘Support Experience (iOS & Android only)’ tab. On this page, you’ll see a button to enable Conversational Issue Filing. Please note: the decision to enable Conversational Issue Filing can only be made once. After you have made the switch, you will not be able to go back to form-based Issue filing. For more information about the differences between these flows, see our April 2018 SDKs announcement. A pop-up will appear prompting you to confirm this action. How do I configure in-app support experience for my app? Once Conversational Issue Filing has been enabled, you’ll be able to configure and customize the in-app conversation flow. We strongly recommend that you carefully review and test each setting to plan the configuration that best suits the end user experience and workflow for your support team. Greeting Message: Allows you to write a custom greeting that will appear to users when they first initiate a conversation. If you support users in different languages, you should add greeting message text for each of those languages. Answer Bot: Enable this Bot to share relevant FAQ suggestions with the user based on their initial outreach. This Bot is an add-on feature that can be unlocked with an account upgrade. Please reach out to success@helpshift.com to learn more. Identity Bot: This Bot will automatically request the user’s name and email address if this information has not been collected previously. If that info is already available on the user’s profile, then this Bot will not ask again. Additional settings you can configure to customize the user experience can be found on the ‘General’ tab. Anonymous Issue Filing: Allow your users to file Issues without their contact information being stored. User Attachments: allow users to attach files during conversations. Show Agent Nickname: Display the nickname that the Agent has set on their account to display to end users during the conversation. Show Agent Typing Indicator: The typing indicator allows end users to see when an Agent is replying to their message, and makes the conversation feel like an engaging experience. Customer Satisfaction Survey: Allow end users to provide feedback after their conversation has ended to gather information about how your Agents are performing. Debug Logs & Breadcrumbs: Debug logs and breadcrumbs allow you to capture valuable technical information for diagnosing crashes and bugs. Resolution Question: Providing a Resolution Question at the end of a conversation prompts the uses to let you know whether their problem was solved or not. If they respond with ‘No’, the conversation is reopened for the Agent to follow up on. View Previous Conversations: allow users to see their past conversations. To learn more about this feature, see How do I allow my end users to see past conversations? A preview of these configuration settings is also available on this page. To save your settings, click the ‘Save & Publish’ button in the top right corner. What is the greeting message, and how do I set it up?